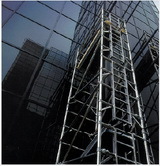 Companies and individuals opt for aluminium access tower hire for many reasons. If you are an individual who needs an access tower for a home project then you are not bound by any legislation but you do need to follow any construction and safety regulations you are given when you hire equipment. If you own a company and you need aluminium access tower hire to complete a business project, you are bound by the Working at Height legislation that came into force in 2005. According to this legislation, which was put together in connection with the Health and Safety Executive, anyone who is employed to setup, dismantle and work on an access tower must have the proper training. When aluminium access tower hire is for the purpose of working in a commercial environment where other workers or members of the public may be at risk, it is vital that any workers are properly competent. The PASMA courses are designed to ensure that workers have passed certain tests to show that they can work competently on an access tower and are aware of the potential hazards associated with working at height. When you manage a company it is your responsibility when you engage in aluminium access tower hire, to ensure that everyone working with that equipment is trained to the proper standard. You are responsible for planning the job and making sure that all the safety checks are carried out so that the structure does not pose a risk to the public, You should make sure that the correct stabilisers, guard rails and harnesses are where they should be to help guard against accidents and falls. Any stray objects need to be removed from the workspace when you have arranged aluminium access tower hire, and this includes objects above the working area that could fall on workers. When you undertake aluminium access tower hire you should inspect the equipment once it has been set up and before it is used. The tower should also be inspected at regular intervals to check whether any of the fittings have come loose and could cause problems. According to regulations you will need to keep a report of all the safety checks undertaken on the equipment and you will need to keep that report for at least twelve weeks after the job has been completed. The report is there as evidence that you did all you could to ensure worker safety, especially if there is an accident. You should not change or alter the tower and platforms if it would cause them to be unsafe. The stairway access tower hire company can provide you with information on allowable and safe alterations to the equipment while it is in use. As the employer it is your responsibility to ensure that you have adequate insurance cover in case of an accident or in case someone other than a worker is injured at the site while work is going on. Failure to ensure that you have sufficient insurance cover could do irreparable harm to your business in the future.